Heat oven to 325°F. With a sharp knife, lightly score surface of ham in a diamond pattern; insert cloves. 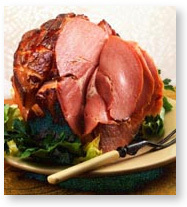 Place ham on a rack in a shallow roasting pan. In a small bowl mix syrup and mustard until blended. Brush mixture over ham. Bake for 1 1/2 to 2 hours, until a meat thermometer registers 140°F. Baste ham with glaze occasionally during baking time. Makes 10 servings. Less than 1 gram net carbohydrate per serving.